ASP.NET MVC provides the architecture needed to separate an application's logic and its UI. Because each component's role is well defined, MVC applications are easy to test, maintain, and extend. The latest version, ASP.NET MVC 4, takes advantage of .NET 4 and includes powerful features like the Razor view engine, Web Matrix helpers, and enhanced extensibility. 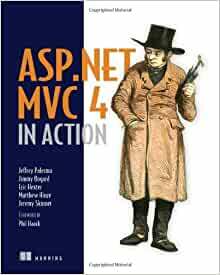 ASP.NET MVC 4 in Action is a hands-on guide that shows you howto apply ASP.NET MVC effectively. After a high-speed ramp up,this thoroughly revised new edition explores each key topic witha self-contained example so you can jump right to the parts youneed. Based on thousands of hours of real-world experience, theauthors show you valuable high-end techniques you won't findanywhere else. Written for developers, the book arms you withthe next-level skills and practical guidance to create compellingweb applications. You need some knowledge of ASP.NET and C#, but no priorASP.NET MVC experience is assumed. Jeffrey Palermo, Jimmy Bogard, Eric Hexter, Matthew Hinze, andJeremy Skinner are all ASP.NET MVPs, ASP insiders, and early adoptersof ASP.NET MVC. Jeffrey Palermo began to use ASP.NET MVC and provide feedback to Microsoft about the product in 2007, more than a year before it was released. He began leading client projects using the technology in late 2008. Along with several editions of this ASP.NET MVC book, Jeffrey has written many articles on the topic and has presented at many conferences including Microsoft Tech Ed, VS Live, and DevTeach. Mr. Palermo is a cofounder of MvcContrib and COO of Headspring Systems in Austin, TX where the company runs a very popular MVC Boot Camp training class. Eric Hexter is a veteran software developer and the Director for the Austin .NET Users group. Eric has run the Austin Code Camp, which is a one-day developer conference, since 2007. In addition to his position in the Austin .NET Users Group, Eric has held the following positions: INETA Membership Mentor for South Texas, ASPInsider, Microsoft Most Valuable Professional (MVP) in ASP.NET, and founder of the Community for MVC virtual usergroup. Eric speaks to user groups and at technology conferences around Texas and the U.S.
Matt Hinze is a programmer and software designer from Austin, Texas. He has successfully delivered technical courses to software developers since 2005. He is also a full-time developer working in the trenches on major software projects. Matt is an ASPInsider and Microsoft MVP for C#. Matt works at Sogeti on a large e-commerce implementation in Round Rock, and lives in the North Austin suburbs with his wife and son. Jeremy Skinner is a UK-based software developer who has been working with the ASP.NET MVC Framework since its first public preview in late 2007 and has been developing applications with it ever since. Jeremy is also a member of the Microsoft ASP Insiders and is involved with several open-source projects including MvcContrib which provides extensions for ASP.NET MVC. I find no reason of not liking this book. It is very good book. Apart from MVC which is covered thoroughly, I learned many good technique for jQuery. Good read. 5 out of 5. I'll not question the bad reviews here, as some may point for the right reasons to problems with the working samples. What I LIKED about the book is its focus on "keep it simple" and its practicality. Yes, it is more for beginners with ASP.NET MVC, but you're walked through the essentials in a pleasant manner, without plunging into crazy complex details, as so many other books on the subject (especially the "Pro" books) do. For instance, you get all you need to know on the views (partial, templates, layouts, sections etc) from concise and well-organized brief presentations. Nice code snippets show you the essentials and nothing more. If you do not have time to waste and just want to quickly acquire the basic ASP.NET MVC skills, this old book could do it. 1.0 out of 5 starsThis book is a rip-off. I purchased this book thinking it would primarily cover the new features in MVC4. The book has some new content, but the authors were very lazy about its presentation, there is no indication of whether the feature you are reading about is new to MVC4. I was over half way through the book and MVC4 hadn't even been mentioned. I finally figured out why... The MVC4 content amounts to a few new chapters at the end of the book. The new asynchronous controllers feature is not even mentioned in the book. They do cover Web API and new deployment features. NOT WORTH BUYING if you are competent in MVC3. This is the first book available on MVC 4. I purchased the MEAP version when it was still going to cover MVC 3. This book is ok, but just ok. It covers a lot of topics but I found that for most of them, it only covers part of them. That part may be just the beginning of the topic, or an advanced feature of the topic. Like I said they cover a lot of topics just not in a way I consider to be thorough. There is not very much on MVC 4, and the author's really dropped the ball covering the new mobile features. I got all the samples working, but needed to fix a few things. I would not buy this book for coverage of MVC 4. If you just want to know what you need to learn in order to master MVC with other resources, it is fine. 4.0 out of 5 starsDon’t trust the other poor reviews on this book. This is a great book for a particular type of reader.